(2) but his delight is in the law of the LORD, and on his law he meditates day and night. (3) He is like a tree planted by streams of water that yields its fruit in its season, and its leaf does not wither. In all that he does, he prospers. (4) The wicked are not so, but are like chaff that the wind drives away. (6) for the LORD knows the way of the righteous, but the way of the wicked will perish. Psalm 1 as whole can be viewed as a piece of wisdom literature. The chapter serves as a reminder of the same precepts that are taught throughout the Old Testament and even into the New Testament. Psalm 1 gives guidance and wisdom to the reader from the writer that the way to prosperity is by giving yourself to the Lord, and staying away from wicked influences. Moreover, the writer makes it clear that those that do not do these things will not prosper and will perish. As far as the division of parts goes, Psalm 1 can be viewed a few different ways and still withhold the poetic and spiritual value it withholds. Our ESV Literary Bible appears to portray the chapter as sets of couplets with a triplet within verses 3 and 4; however, I see optimal spiritual and poetic value by looking at two different ways it can be divided (both of which have no effect on its spiritual value). For instance, you could look at it as being divided into three parts in which the first part is verses 1 through 3 containing information about a man that is blessed by God, the second is verses 4 and 5 which are about the ungodly, and verse 6 which is closure to the matter bringing both subjects together. Another way of looking at it is by grouping verses 1 and 2 due to their unifying idea of what it takes to be a godly man. Next, you could group verses 3 and 4 together to show the contrasting result of doing and not doing the things mentioned in verses 1 and 2. Last, looking at verses 5 and 6 which bring to closure the poem as a whole by showing what God’s view on each case is. Moreover, in viewing it this way, the parallelism that is used in this chapter is best viewed through this scope. In verses 1 and 2 we find the writer expressing “to-do’s” and “not-to-do’s” for being blessed by God. In verse 1 the writer expresses the “not-to-do’s” which consists of details about how the man that abstains from sinful surroundings will be blessed in what he does. This is a theme that is constantly seen throughout the Old Testament as God commanded the Israelites to destroy those that are foreign lest they be lead away by their gods. This is seen all the way back to the Mosaic Law (Ex. 23:31-33), and this theme of not being around the wicked is continued all throughout the Bible. Furthermore, in verse 2 the writer gives the “to-do’s” which is to be devoted to God and His Law. This as well as verse 1 is a concept that goes all the way back to Moses’ Law and continues throughout the Bible. Verses 1 and 2 as a whole are essentially two contrasting extremes to express one subject—a faithful man of God. On one hand you have the bad things that this person should not do, and on the other you have the good thing that this person should do. This sets the theme for the rest of the chapter in that expresses what leads to a person being blessed, and by logical deduction what leads to a person perishing. Verses 3 and 4 follow up with this theme with the meat of the chapter both spiritually and poetically. Interestingly enough, verses 3 and 4 are the meant of the spirituality, and contain many different layers of poetic technique. These verses are about how this blessed man from verses 1 and 2 will prosper (verse 3), while the man that does not behave the same as the blessed man will not prosper (verse 4). Verses 3 and 4 together act as an antithetic parallelism full of similes and imagery in which the thoughts of verse 3 are contrasted by verse 4. 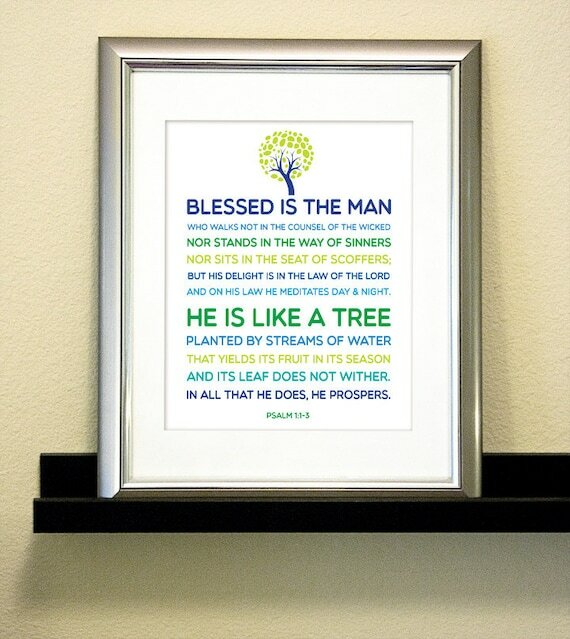 Verse three uses a simile in which the man that is blessed is compared to a tree that is planted by water. This is not only just a simile, but it acts as imagery for what a faithful person will be like combined with symbols that are seen throughout the Old and New Testament. The symbols are water which symbolizes life through God and His cleansing power (Noah and the Ark, Baptism, and etc.) and fruit which symbolizes prosperity in both the Old and New Testament (Gen. 1:22, Gen. 9:1, Jn. 15:8). Moreover, this imagery, simile, and symbolic references set up an emblematic parallelism with the final words of verse 3, “In all that he does, he prospers.” The different modes of figures of speech are all inferring that this man of God is prosperous, and ends by telling the reader that this man is prosperous. This verse is then contrasted with verse 4 through antithetic parallelism. Verse 4 contrasts this blessed man of God by describing the wicked who—through logical deduction—has not done the things in verses 1 and 2. Verse 4 is about the wicked that are compared to chaff through the use of a simile. Chaff is a symbol in the Old Testament that is often used to describe one who lacks fruit bearing character, and this makes sense since chaff is essentially dried straw. Through this simile and symbolism, verse 4 is showing how that the wicked are not prosperous, but are dried rubbish that will perish. This goes back to the narratives of the Old Testament again by symbolically referencing the droughts that the Lord punishes the children of Israel with. Those that are wicked will be forced to endure droughts and besieges by other armies, but those that follow God will have rain and more than they could ever ask to receive. Verses 5 and 6 bring closure to the chapter by bringing everything into perspective. Verse 5 speaks of how that the wicked will not stand in judgment (they will perish) and how that the sinners, no matter how hard they try to go unnoticed, will not be recognized by God as the righteous. Moreover, verse 6 brings the contrast of the wicked and righteous to perspective by showing that not only will the wicked not prosper (while the righteous will), but that the wicked will perish in the eyes of the Lord while the righteous will be preserved. These verses serve as a climax to the chapter in that they – as the saying goes—bring down the hammer. These verses are to show the reader who has control and who has the power, and we can clearly see that the writer infers that it is God who has the ability to destroy or uplift. This idea is one that is seen throughout the Old Testament and even the New Testament; therefore, the concluding remarks of the writer serve as a good reminder to the reader that the path he/she should choose is the path of the righteous man that turned neither to the left of God’s will. Historically speaking, the writer of Psalm 1 is unknown; however, there is a case to be made for how David could have been the writer of this particular Psalm. Through examining the chapter one could easily infer that this was written by David at the end of his life. After looking back on his life and seeing how he prospered in all that he did while he was following God’s will, seeing how Saul failed because he strayed so arrogantly from God’s will, and seeing how he was inflicted chaos due to the sinful act with Bathsheba and Uriah the Hittite. David saw throughout all of his life how that when following God’s will and staying away from corrupt influences, he prospered. Moreover, David saw through the end of his life and the end of Saul’s how that straying from God leads to turmoil and a lack of prosperity. Therefore, there is a case to be made that David wrote the first chapter of the book of Psalms. Whether he did or not is unknown, but David certainly would have had the wisdom and experience to write this piece of wisdom literature. Posted on October 20, 2014 by dgaskins08	This entry was posted in Uncategorized. Bookmark the permalink.